Whether you are moving down the street, or across the country, we look forward to helping you relocate. Moving can be a stressful situation and we are equipped to handle complete home and office moves. SeaPort Moving is a fully licensed and insured company that is located in Vancouver, WA. Locally we service the entire Portland area, but we can relocate you to anywhere. We provide free, on-site estimates, residential and commercial services, furniture protection, packing and so much more. From start to finish, you will receive quality, professional service and one of our trained relocation consultants will be there to answer all your questions. Finding the best moving service to suit your needs should not be difficult. Compare SeaPort Moving prices and service with other Portland companies. We are confident that our prices are competitive, our moving expertise cannot be beat and you will not find better quality service. We offer a variety of options to fit any budget. Whether you are looking for full or partial services, SeaPort has you covered. From boxes and tape, to specialty crating. 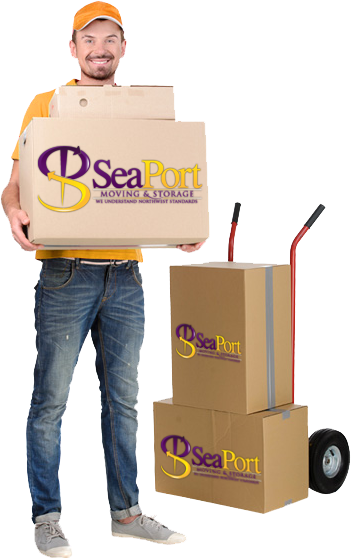 SeaPort is your one stop shop for your moving needs! Let's face it, accidents can happen, don't get caught unprepared. Don't have homeowners or renters insurance? No problem! SeaPort partners with multiple insurance companies to cover all your precious items. All moves come with a guaranteed delivery window or we pay you for every day we are late! Online tracking allows you to stay updated on your delivery. Need it there faster? Ask your representative about our expedited services today! OUR COMMITMENT TO QUALITY AND SECURITY MEANS THAT WE ONLY TRAINED STAFF FOR PACKING AND MOVING SERVICES. SeaPort Moving & Storage was designed with one concept in mind – providing the Seattle/Portland area with one company they can count on and trust.